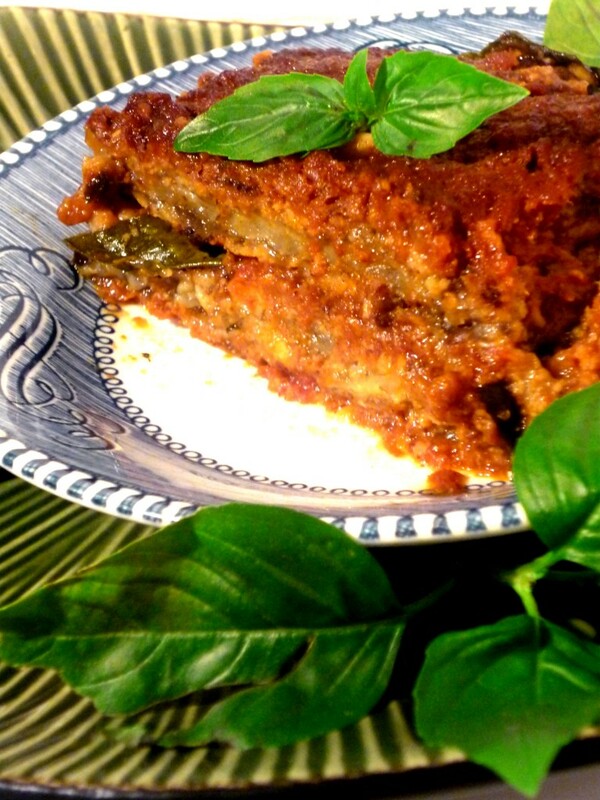 One of the yummy moments I remember from visiting Italy a few years ago, was my aunt Paola’s melanzana parmiggiana. 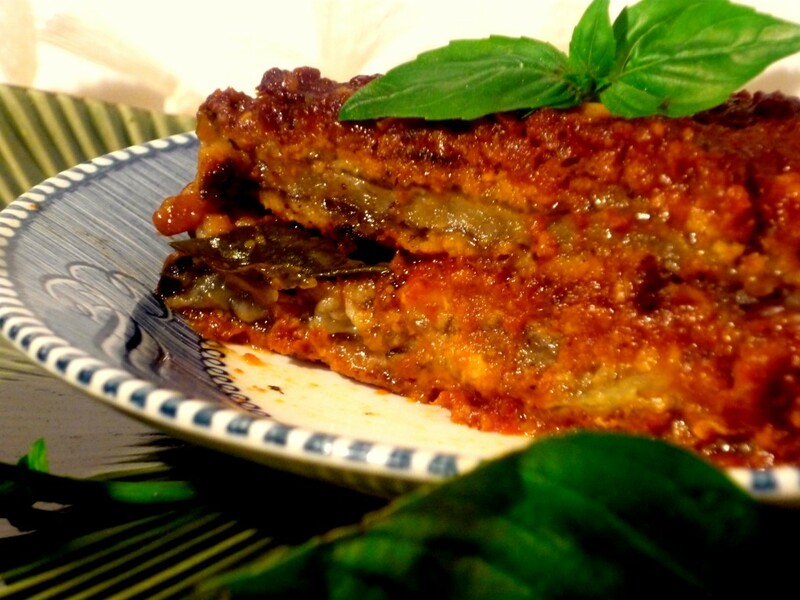 Cutting my fork through the hot cheesy layers, the eggplant and sauce melting together…. *sigh*. Good times. Anyhow, after making the Turkey Bolognese sauce a few weeks ago, J wanted to know how to eat it if you didn’t eat any grains at all… it got me thinking… If you don’t eat pasta, you COULD eat this sauce with eggplant! 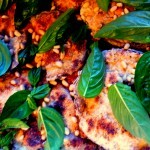 Or even chicken cutlets! So…. I decided that eggplant parmesan would be the perfect way to use the sauce by baking it all together. Here it is, in allllll its glory. 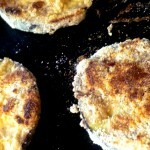 NOTE: This recipe linked to Simply Sugar and Gluten Free Slightly Indulgent Tuesday blog roundup! Changing the sauce for a regular tomato sauce will make this recipe vegan. If you are a strict Paleo, this recipe will not qualify because of the nightshades. Prepare the Turkey Bolognese Sauce ( I like to have big batches of sauce in my freezer so I can just unthaw if company comes over, or if I feel like making these types of casserole recipes). Vegan: use this tomato sauce recipe. Mix the almond meal and amaranth flour together, and add 1/2 tsp salt. Cut the eggplant into 1.2 inch slices. Thoroughly coat the eggplant one slice at a time: Press the slice into the starch, brush off excess. Dip into the water /flax mixture quickly, enough to cove both sides with wetness. Press into the almond/amaranth mixture. Place on a hot griddle or pan, and cook until dark golden. You can add a tbsp of oil per batch of eggplant, or you can cook them dry. Perosnally, I prefer the crispy edge of using the olive oil. Place the cooked eggplant on a rack to dry while you are doing the rest of the slices. When you’re done with the eggplant, get a large casserole container. Spread the bottom with the sauce, but don’t spread very thickly (about 1/2 inch is sufficient). Layer on the eggplant slices. Cover each slice with 1 tsp of nutritional yeast or ground cashew or smashed pine nuts (or if you eat dairy, then, 1 slice provolone plus 1 tsp parmesan per eggplant piece), then place on top a few fresh basil leaves or a dot of pesto. Cover everything with a layer of sauce. Repeat with the next layer of eggplant. Bake at 350 for about 1 hour and 20 minutes- the sauce should be coming up bubbling. YUUUUUUUM. I can’t even tell you how fabulous!! Maybe throw in a few side dishes of Roasted Broccoli, or Apple Radish Salad, or Asparagus Citrus Salad.